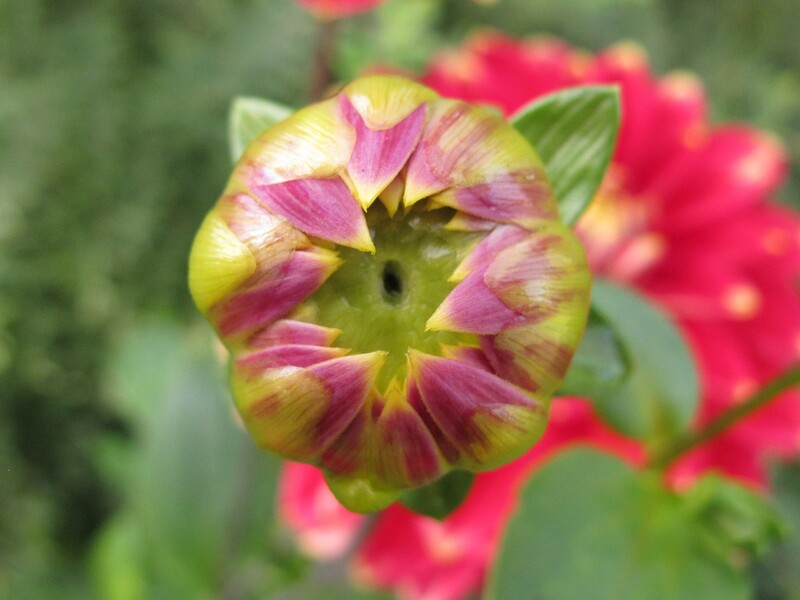 This is a guest post I wrote for the lovely guys at Modern Mint, a garden design firm. I met the Director Darren Lerigo at a Garden Media Guild event, and he asked for my thoughts about what gardens offer children. For a few scary minutes this summer I lost my three year old daughter. We’d been pottering outside one minute, and she was gone the next. I scoured the garden, then the house, then the garden again. She’s quite sensible, so I was pretty sure she wouldn’t have wandered off by herself. And the dogs would have made a racket if anyone had come into the garden. But as time ticked on I became worried. I finally ran out to the road feeling a bit panic stricken. Then I spotted her on the overgrown bank at the edge of the garden. She was quietly gathering leaves and putting them in a stacking-cup, murmuring to herself as she worked. I broke the spell, shouting that I’d been worried, why didn’t she come when I called and what was she doing out there anyway? It turned out her imaginary friend was unwell. He needed the leaves to make him better. Of course he did. I don’t really consider the bank a safe place for a young child. It’s steep and rough, full of nettles, thistles and other spiky things. Not to mention the four foot drop to the lane. It’s sectioned off from the main garden by a stretch of chestnut paling with a seldom used, tricky-to-open gate. I asked how she’d got out there. She answered by pushing a loosened pale to one side and squeezing back through the fence. A big part of me wanted to say she mustn’t go out there again. But I found myself just asking her to be careful. And not to eat any leaves. 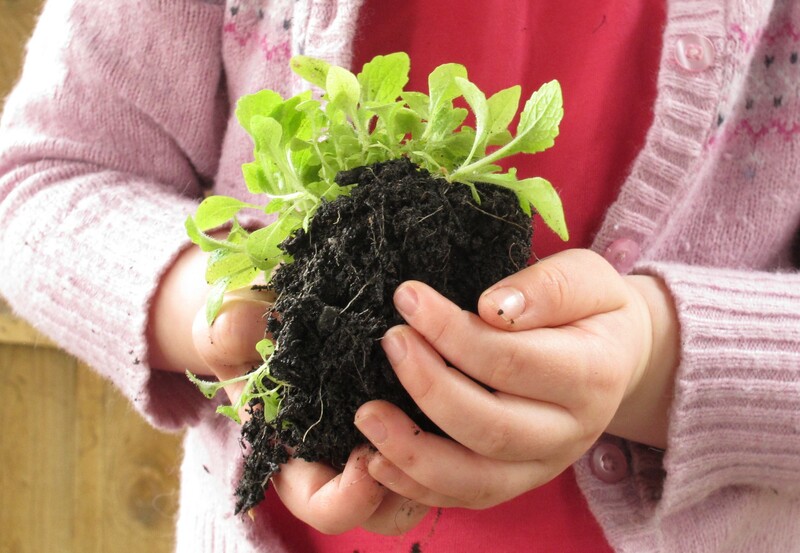 Exploring, hiding, making dens and imaginary concoctions is heaps of fun for kids. 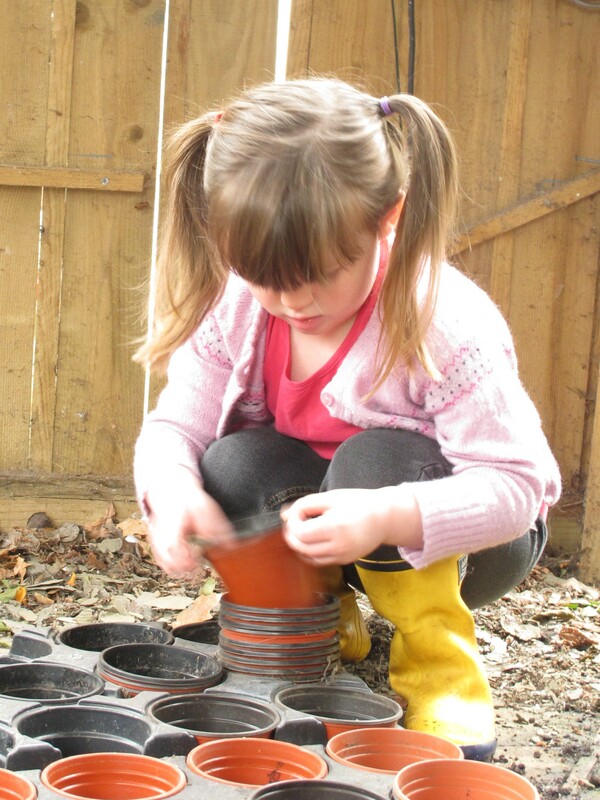 Experts in child development reckon outdoor free play is really important. Especially if it involves taking reasonable risks. Gardens offer a perfect springboard for this. Even a small plot has the potential to offer a wilderness ripe for adventures; providing adults are prepared to be a little bit indulgent. In a medium to large garden, it’s easy to let a forgotten corner run wild. Leave the hedges untrimmed, the grass uncut. Better still, sow a meadow mix to create a haven for children and nectar-lovers alike. You could leave a few bits of wood, sticks, bricks and other random stuff lying about for impromptu den-making or props. If the untidiness is difficul t to live with, you can always screen it off with a trellis and a few climbing plants. Smaller gardens might be able to accommodate a wigwam or two – these are easily rigged up using hazel sticks or canes from a garden centre. Build them with a wide base, at least 1.5metre diameter, and leave enough room between two of the uprights for an entrance. 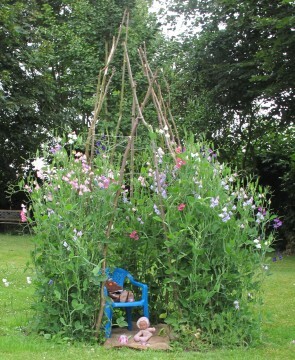 Runner beans or sweet peas planted in May or June will soon provide enough cover for a little-person’s summer hideout. Whatever happens, don’t tell the kids what you’re doing or why. 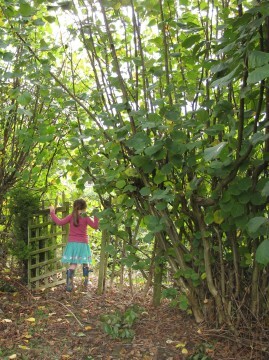 Hidey holes and wildernesses are ten times more exciting if the grown-ups don’t know about them. They need to feel like unchartered territory or a forbidden land. I learnt this the hard way when we made a sweet pea castle for my daughter. She was very enthusiastic about building the structure and growing the plants, but barely ventured in there all summer. On the other hand, every under-five who came to play made a bee-line for it. No doubt they assumed they were being terribly naughty pushing through the flowers to sneak inside. 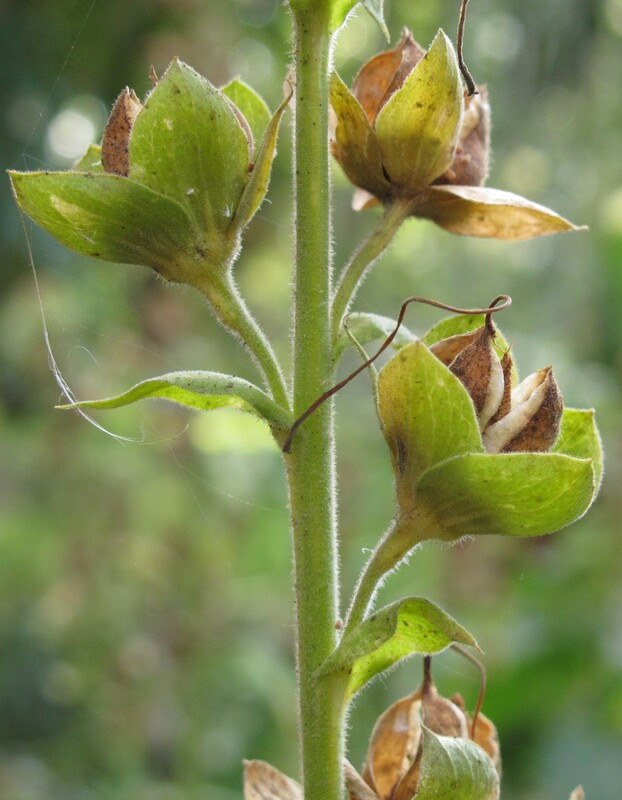 Six weeks or so ago, we plucked a couple of foxglove seedpods. 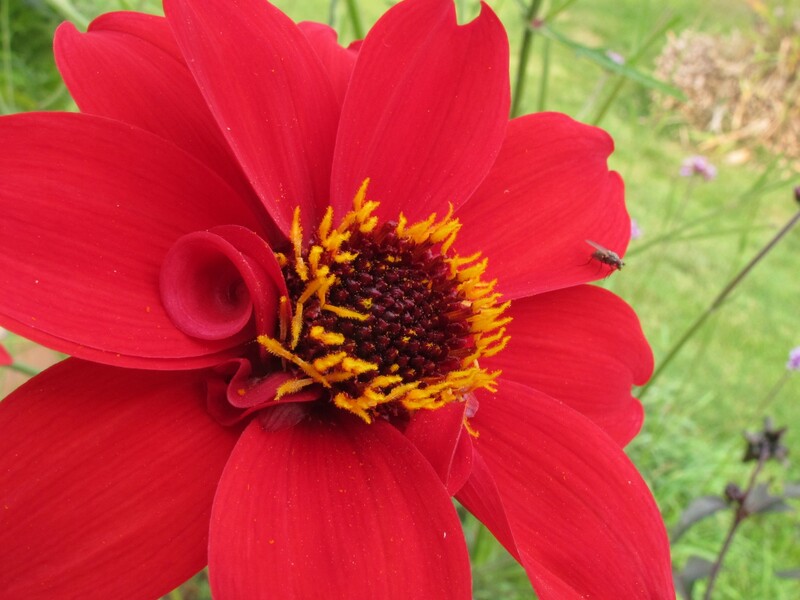 Each was a little capsule filled with thousands of seeds barely the size of a pinhead. We sprinkled them over a tray of compost to see what would happen. 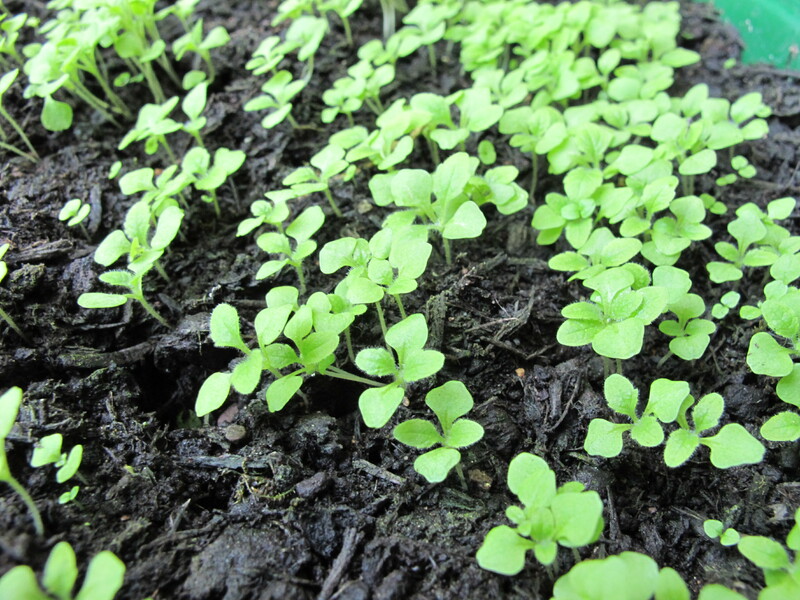 Within days the tray had sprouted a dense green mass of tiny seedlings. Last year we lost several batches after they germinated, so I didn’t hold out much hope for our homegrown seeds. But they kept going, and when I checked on them this week they were clearly ready for pricking out. Since we had more than we could possibly hope to use in the garden, I decided it wouldn’t be the end of the world if a few got snapped. So I let M loose on a tray of her own. She was very careful, talking softly to them as she tucked them into their pots. But I noticed more than one looked a bit deficient in the root department after she separated it from the others. It doesn’t matter. 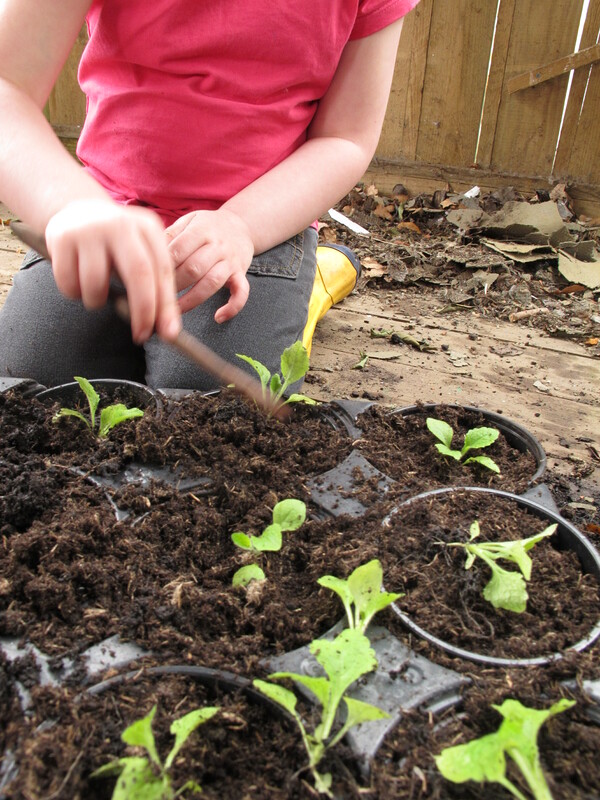 When we were in the garden this afternoon, I noticed swathes of tiny self-sown foxglove seedlings. They’re a few weeks behind the ones we pricked out, but if only a fraction survive the winter we’re going to be engulfed in them come spring. Here’s a post about this year’s foxgloves. 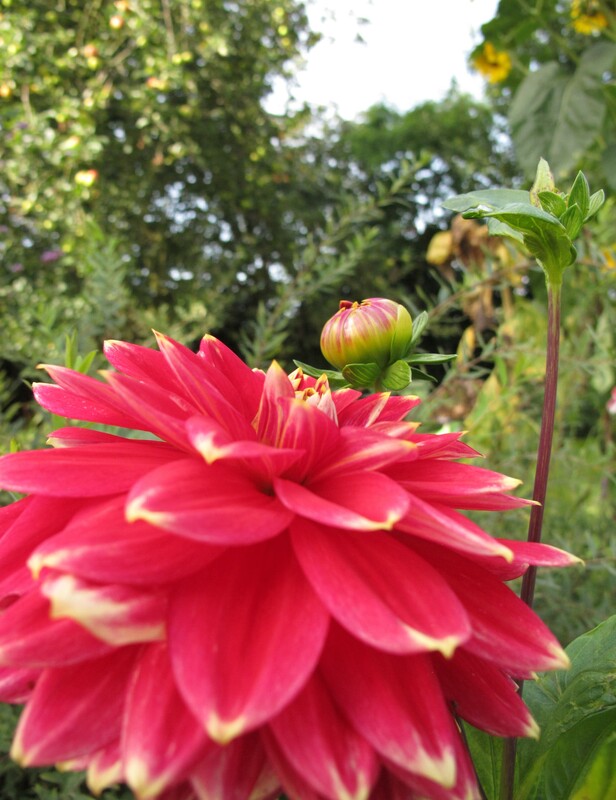 As September plods damply on, I find myself thinking about planting for next year. 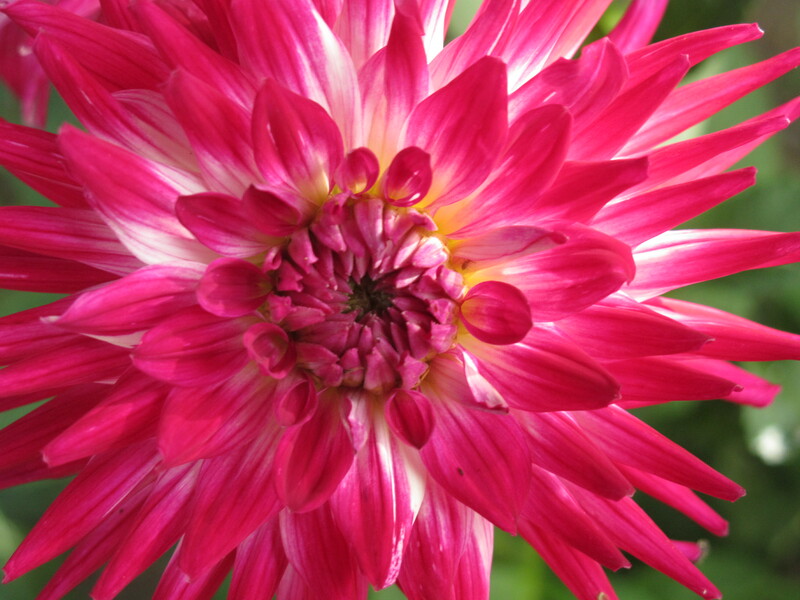 We have a long list of spring bulbs that we must get around to ordering. And we are going to devote much more space to alliums. But it’s the late summer/autumn that we really need to plan for. 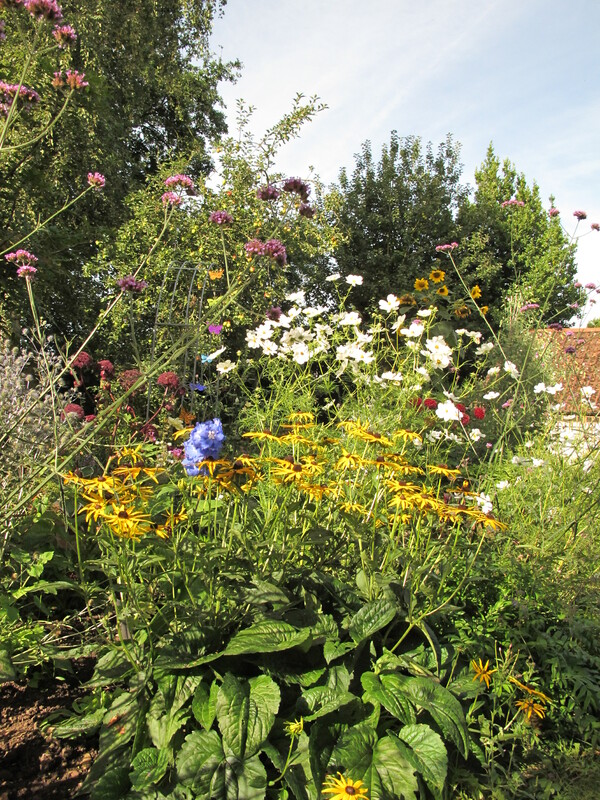 If it wasn’t for Steve the garden would be quite desolate now – it was him who grew the rudbeckia, cosmos and verbena bonariensis that are keeping things colourful at the moment. 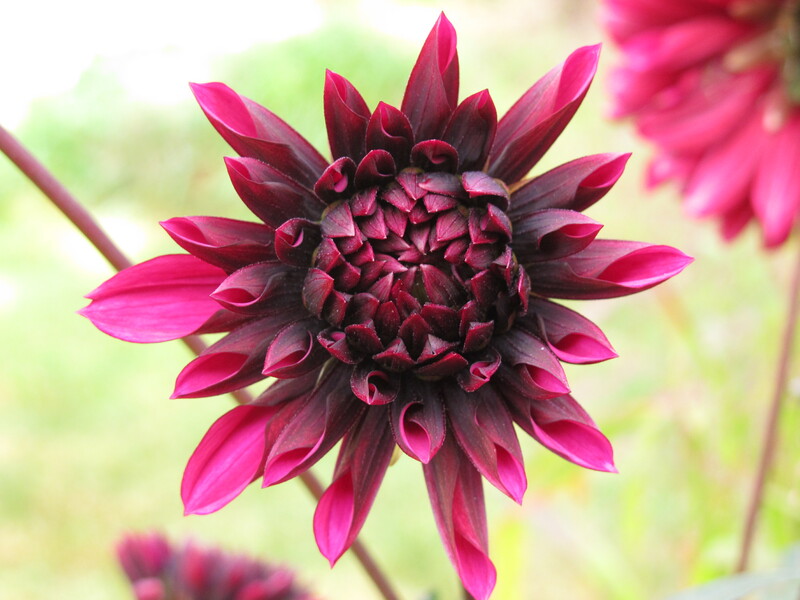 He has grown some echinacea from seed this year that will hopefully survive the winter for planting out in the spring to flower late summer.